Avocados are the “poor man’s’ staple” in Uganda, grown in rural villages and seen as such a common fruit as to be nearly worthless. Our colleague, Jonathan Nsamba, a nutritionist trained at the London School of Tropical Medicine and NCD project lead for our Kampala based partner “Lifenet”, was amused to hear that they are sold at a premium in UK supermarkets. Whilst East Africa exports this ‘superfood’ to us, billboards from Entebbe airport promote the aspirational messages of the leading brands of soft drinks and fast food chains. Africa’s growing populations are increasingly affected by so called “lifestyle diseases” or Non-Communicable Diseases (NCDs), which include high blood pressure, type 2 diabetes, strokes and heart attacks. These diseases disproportionately affect the poor, and Uganda is no exception. PCI is testing models of primary health care across African markets which are priority countries for our founding funder of the Healthcare Innovation Programme – the Botswana based corporate, Letshego Financial Services. Our programme aims to tackle the growing burden of NCDs through prevention and early intervention but also importantly through ongoing affordable and appropriate healthcare within the community. Sharing expertise in NCD care and systems with well positioned local partners, PCI’s mission is to strengthen the capacity of primary care systems to tackle the NCD crisis which is expected to impede the global goal of ending extreme poverty by 2030 because patients whose income is set to modestly grow will divert funds to pay for costly treatments and drugs. Whilst in Masaka, where this project is being piloted, we met with the Diocese health coordinator Father Emmanuel, who was excited to hear our progress and keen to share what we were doing with all the health centres in the Diocese. Tracy, the officer in charge at one of the three selected health centres for our pilot, expressed their enthusiasm for the project. 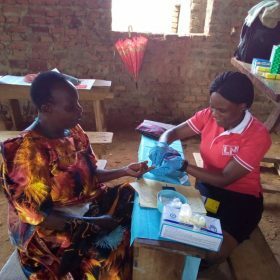 Within these communities we will be proactively working with the health centre teams to find patients with hypertension and diabetes, enrol them in care, monitor and evaluate each aspect of that care, and at the end of one year measure their retention in care and lessons learned. This will provide valuable experience in developing an effective Ugandan NCD primary care model. It is now April 2018 and our pilot has launched – at the three pilot health centres: staff have been trained, monitoring and evaluation systems developed, equipment ordered, and screening events scheduled. We look forward to reporting back on lessons learnt as retention data emerges from the project.